76 THE SHOP NOVEMBER 2018 SKETCHBOOK PROJECT VEHICLE 1966 FORD BRONCO United Pacific Industries will feature a retro 1966 Ford Bronco in its booth #23175 at the 2018 SEMA Show. 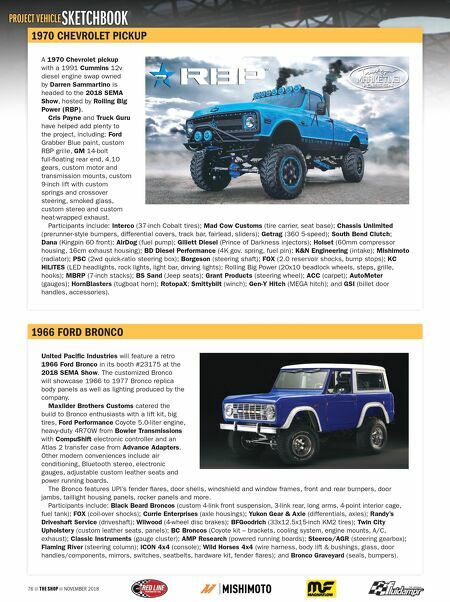 The customized Bronco will showcase 1966 to 1977 Bronco replica body panels as well as lighting produced by the company. Maxlider Brothers Customs catered the build to Bronco enthusiasts with a lift kit, big tires, Ford Performance Coyote 5.0-liter engine, heavy-duty 4R70W from Bowler Transmissions with CompuShift electronic controller and an Atlas 2 transfer case from Advance Adapters. Other modern conveniences include air conditioning, Bluetooth stereo, electronic gauges, adjustable custom leather seats and power running boards. The Bronco features UPI's fender flares, door shells, windshield and window frames, front and rear bumpers, door jambs, taillight housing panels, rocker panels and more. Participants include: Black Beard Broncos (custom 4-link front suspension, 3-link rear, long arms, 4-point interior cage, fuel tank); FOX (coil-over shocks); Currie Enterprises (axle housings); Yukon Gear & Axle (differentials, axles); Randy's Driveshaft Service (driveshaft); Wilwood (4-wheel disc brakes); BFGoodrich (33x12.5x15-inch KM2 tires); Twin City Upholstery (custom leather seats, panels); BC Broncos (Coyote kit – brackets, cooling system, engine mounts, A/C, exhaust); Classic Instruments (gauge cluster); AMP Research (powered running boards); Steerco/AGR (steering gearbox); Flaming River (steering column); ICON 4x4 (console); Wild Horses 4x4 (wire harness, body lift & bushings, glass, door handles/components, mirrors, switches, seatbelts, hardware kit, fender flares); and Bronco Graveyard (seals, bumpers). 1970 CHEVROLET PICKUP A 1970 Chevrolet pickup with a 1991 Cummins 12v diesel engine swap owned by Darren Sammartino is headed to the 2018 SEMA Show, hosted by Rolling Big Power (RBP). Cris Payne and Truck Guru have helped add plenty to the project, including: Ford Grabber Blue paint, custom RBP grille, GM 14-bolt full-floating rear end, 4.10 gears, custom motor and transmission mounts, custom 9-inch lift with custom springs and crossover steering, smoked glass, custom stereo and custom heat-wrapped exhaust. 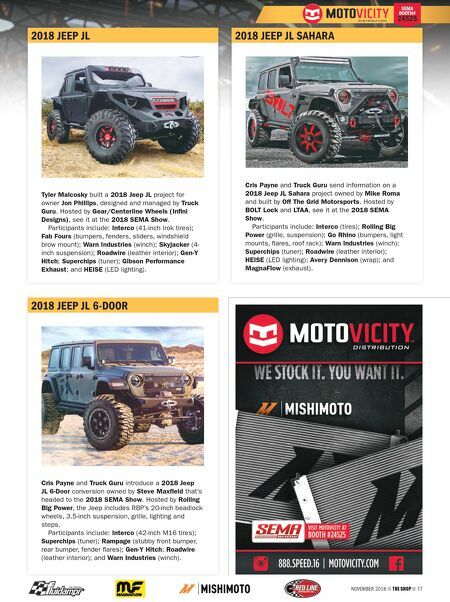 Participants include: Interco (37-inch Cobalt tires); Mad Cow Customs (tire carrier, seat base); Chassis Unlimited (prerunner-style bumpers, differential covers, track bar, fairlead, sliders); Getrag (360 5-speed); South Bend Clutch; Dana (Kingpin 60 front); AirDog (fuel pump); Gillett Diesel (Prince of Darkness injectors); Holset (60mm compressor housing, 16cm exhaust housing); BD Diesel Performance (4K gov. spring, fuel pin); K&N Engineering (intake); Mishimoto (radiator); PSC (2wd quick-ratio steering box); Borgeson (steering shaft); FOX (2.0 reservoir shocks, bump stops); KC HiLiTES (LED headlights, rock lights, light bar, driving lights); Rolling Big Power (20x10 beadlock wheels, steps, grille, hooks); MBRP (7-inch stacks); BS Sand (Jeep seats); Grant Products (steering wheel); ACC (carpet); AutoMeter (gauges); HornBlasters (tugboat horn); RotopaX; Smittybilt (winch); Gen-Y Hitch (MEGA hitch); and GSI (billet door handles, accessories).